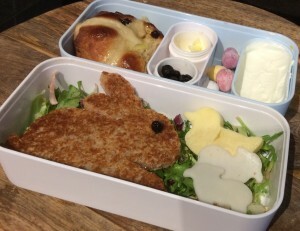 The Japanese have taken the lunch time meal into an art form. I haven’t gone that far yet, but have definitely taken some inspiration from my recent trip. 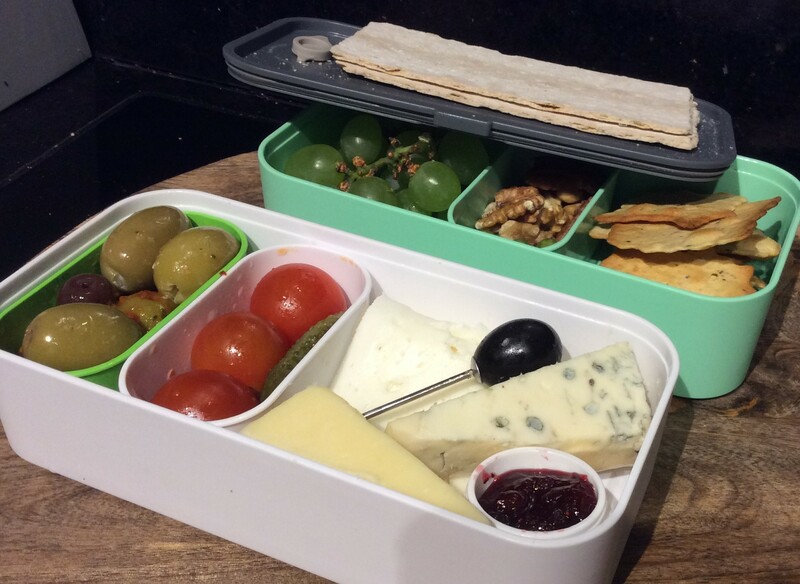 Bringing your lunch into work is a British habit. Living in Germany everyone always takes a proper lunch break, often a three course canteen meal, with their team mates. I always bring my own along, this is usually some left overs from an evening meal or some veggie dishes that I make in bulk and freeze, leaving to defrost over night. At work I am lucky to have a fridge and a microwave to use. Several of these ideas simply need to be kept in a cool place and be eaten cold. If you give them a try I would love to see a photo or send me some ideas of your own using the recipe tab. One of the big surprises from my recent trip to Japan was that there wasn’t many sushi restaurants. 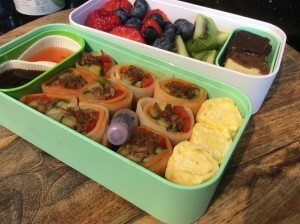 Most Japanese families take pride in making their own perfectly formed sushi and we saw some of them eating lovely bento boxes on the bullet trains. If you are going to have sushi in your Bento you would definitely need to keep it in the fridge and it shouldn’t enjoy the raw fish kinds. The Japanese way of eating is small portions of lots of different things. They tend to serve them separately in lots of different crockery. In a Bento box this is achieved by having different items packed into different parts of the box. They often have soy sauce to help season. 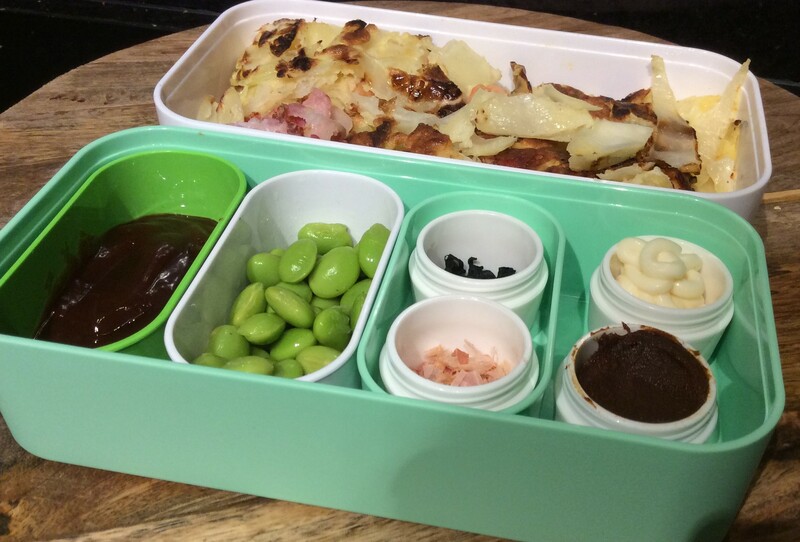 Over the next few weeks I will try and post some of my ideas for a Bento style lunch from around the world. I hope you will be inspired to. 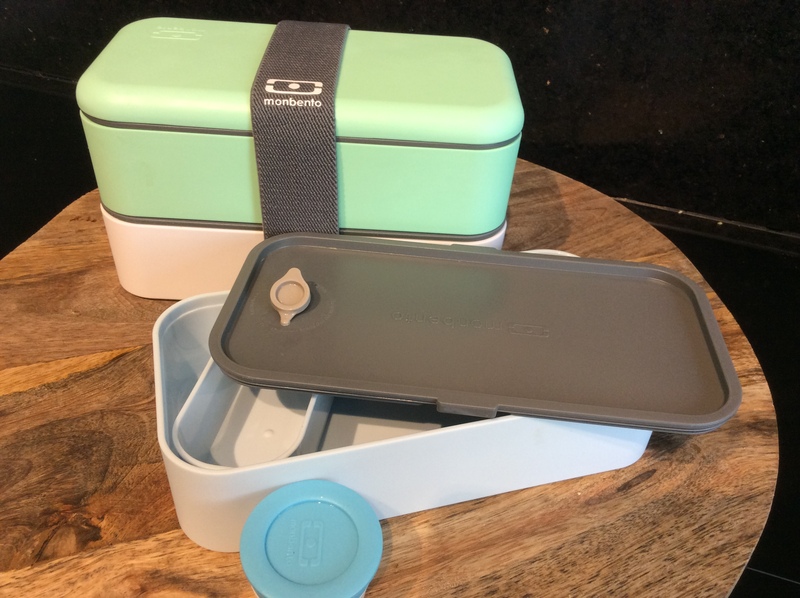 You don’t need to have some special boxes for making Bento but it is always nicer to have something pretty. I have splashed out on a few mini sauce pots. Another way to help keep things separate is to use some silicon cup cake moulds. The boxes I have shown here can be bought on line. I bought my Monbento boxes directly from their website. 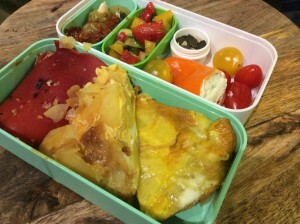 They have also have a members page, Clubento, if you need some further inspiration. Inspired by Japanese street food. A great healthy light meal. Make the pancake the night before and keep the box in the fridge. I reheat it gently in the microwave and drizzle with sauce and mayonnaise and sprinkle with some seaweed and bonito flakes. To follow the Japanese tradition you can serve it with some miso soup simply made by using some miso soup paste and sprinkling in some of the dried seaweed. I love edamame beans so included some of these. I buy them frozen and they only need about four minutes to cook in boiling water, take them out of the pods so that take up less room, sprinkle with a little salt before eating. A British classic picnic favourite. 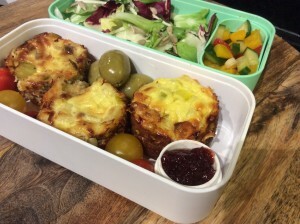 This version is healthier baked Scotch Egg with added caramelised onion and Italian seasoning to make it extra special. I have served it with some pickled gherkins, olives and tomatoes and some homemade German potato salad and simple coleslaw. Serve cold, keep in a cool place till you are ready to eat it. Inspired by the great Spanish Omelette (Tortilla). Can be made as a veggie version or my favourite is to add a bit of chorizo. I served my omelette with some olives, tomatoes, toasted seeds, salsa and stuffed peppers. I love cheese and biscuits and this is a way of combining them into one tasty treat. I made a walnut and almond shortbread biscuit and then topped it with a creamy blue cheese, leek and pear topping. Serve with a simple salad and cranberry sauce. If you are like me and love vegetable samosas but don’t like deep frying, this is an easy way to get the taste. I served mine with red pepper and coconut dip, raita dip and a simple green salad. Optional extras were a few wasabi peas and some sugar coated fennel seeds for afters. Yummy. This bento has cooked chicken and bacon with BBQ sauce. 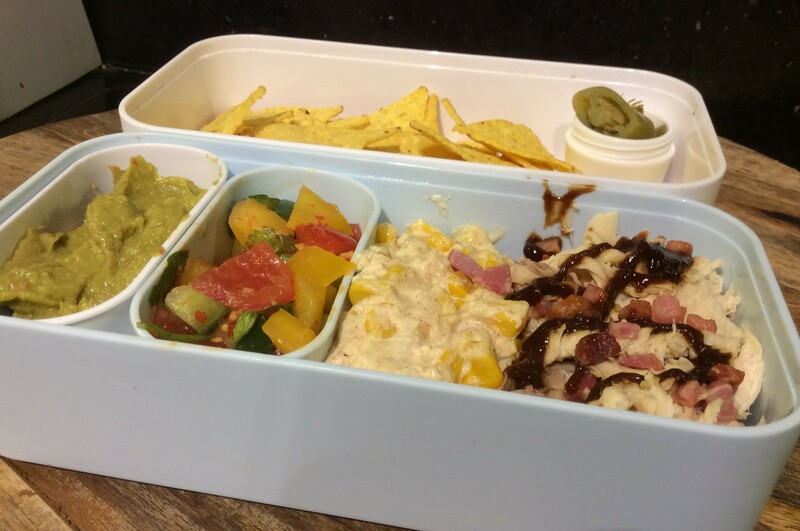 Accompanied with my favourite Mexican dips of cheesy sweetcorn, guacamole and salsa. Keep the chicken and dips box in the fridge and the nachos can be kept at room temperature. Haven’t cooked. Then this a great alternative to a bought sandwich. 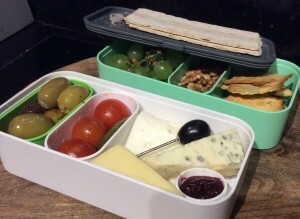 Use your favourite cheese and biscuits. I love WASA’ s rosemary thin biscuits and their black olive biscuits. Great with olives, nuts and grapes. I had some cranberry sauce to go with my blue cheese. Chutney would also be great. I have been inspired by some of the very fancy Bentos online. This isn’t as artistic as some of the Bento’s but didn’t take to long to do either. I made a cheese and ham rabbit toasted sandwich, with a cheddar cheese duck and some goats cheese lambs. For a sweet treat there is a homemade hot cross bun, a traditional British Easter favourite and some Cadbury mini eggs. Tasty and fun. 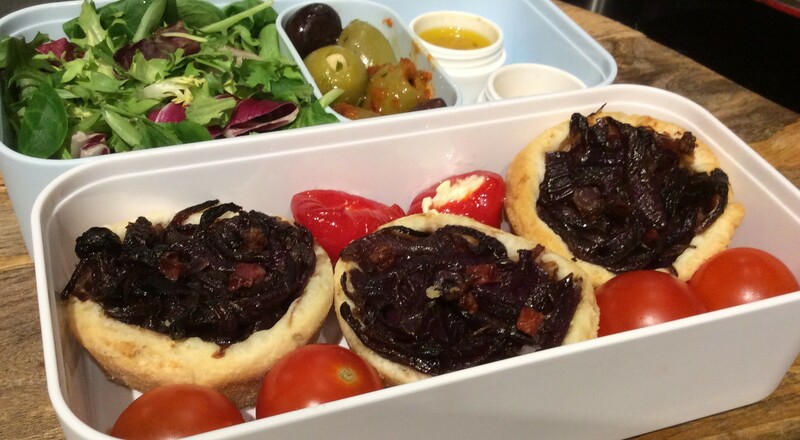 These tarts combine two of my favourite ingredients goats cheese and red onions. 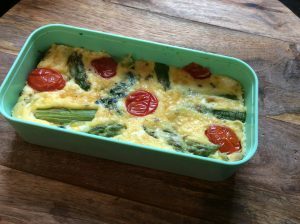 The recipe takes about 1 hour to make, great for parties and any left overs can be used for lunch. Serve with a simple salad and some olives. 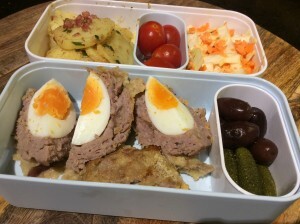 This bento was inspired by my favourite lunchtime meal from Marks and Spencers. It has taken me several attempts to get the process for making the Mooli rolls right. 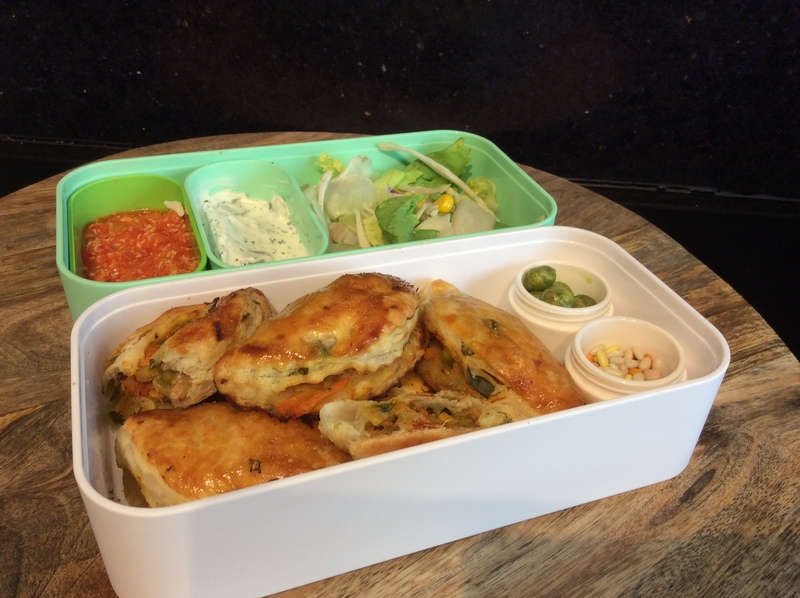 You can fill them with meat or fish and your favourite dipping sauces. Mooli rolls are very low calorie and healthy and gluten free. This meant I was able to include some of my naughty millionaires shortbread in the box. I have also included a Japanese egg roll for extra protein. Shortbread doesn’t just have to be just for Christmas. 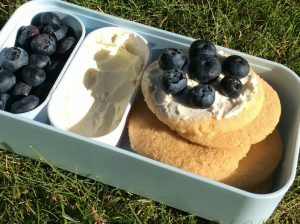 Turn traditional shortbread into a Summer picnic treat by simply spreading them with cream cheese and topping with your favourite summer fruits just before serving. 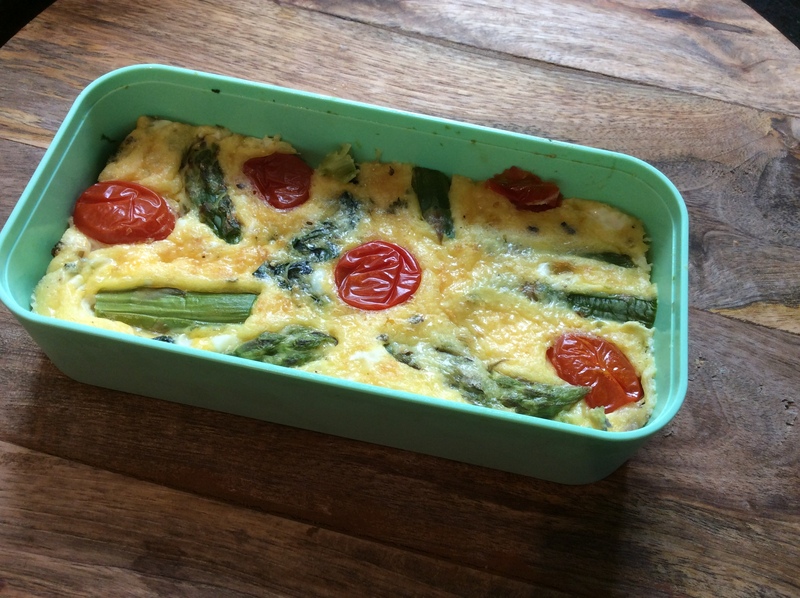 Its spargel time in Germany, asparagus for us English. This dish makes a tasty light lunch and can be served hot or cold. Serve with a simple salad.